Nearest: Tube Station: Queensway 281 yards (256 metres), Railway Station: London Paddington 0.7 miles (1.1 km), Motorway: M4 Junction 1 4 miles (6.4 km). On the Bayswater Road opposite Hyde Park and close to Paddington Station is the Doubletree Hilton London Hyde Park Hotel. This is a central London location, just to the North West of the centre. Bayswater is quite a mix of shops, upmarket residential apartments and many budget/tourist class type hotels. The area has a large middle eastern population and the nearby Edgware Road caters to this market with many middle eastern type shops and restaurants. Opposite the hotel Hyde Park along with Kensington Gardens forms one of London's most popular open spaces with much to see and do including horse riding, boating (weather permitting), the Serpentine gallery, many statues and dedicated garden areas along with several places to eat and snack. The hotel is within walking distance of shopping, bars and public amenities notably at Queensway (includes an ice skating rink, swimming pool and covered shopping centre called Whitley's), Kensington High Street and Notting Hill this is a great location to base a sightseeing holiday from. Bayswater Road itself is a busy main road where London Taxi Cabs are always easy to hail and where on Sundays a busy market for paintings and art works take place. The Bayswater Road is actually part of the A40 dual carriageway which goes all the way out to Oxford and beyond. Less than half a mile way is the famous Portobello Road Market where an antique market takes place on Saturdays and where the shops are open all week. Nearest attractions include Kensington Palace (0.4 miles), Linley Sambourne House (0.7 miles), Royal Albert Hall (0.8 miles), Alexandra Flemming laborator y (0.9 miles) and the Albert Memorial (0.9 miles). The Doubletree Hilton London Hyde Park Hotel offers view over Kensington Gardens from the top floors and walking distance from the bustling shopping of Queensway and the more chic and upmarket Notting Hill. Bedrooms are contemporary and decorated with modern artwork. All rooms have En-suite bathroom (plus toiletries and anti-steam mirror). Amenities include full length mirror, Tea and coffee making facilities, air-conditioning, flat screen TV with internet access, Pay to view movies, 2-line direct dial Telephone, Trouser press, desk, full length mirror, hospitality tray and Hairdryer. Rooms have Hypnos and Sealy beds which have Egyptian cotton sheets,anti-allergenic pillows and a duvet. Executive rooms are on the seventh floor and so have great views of the surrounding area. They also feature upgraded toiletries and complimentary movies, Internet access and newspaper. Room configurations include Twins, doubles, Suites and studio rooms. Room service is 24 hours. The Ramada has accessible bedrooms with adapted bathrooms. Onsite at the Doubletree Hilton London Hyde Park Hotel are the air-conditioned Art's Bar and Art's Restaurant. The Arts brasserie restaurant is contemporary in style and serves traditional and internationally inspired dishes along with fine wines. Atmosphere is relaxed and menu is seasonal. Dine al fresco in summer on the terrace. Open: 06.30-10.00 (Saturday 07.00 till 11.00, Sunday till 12.00), 17.30 till 22.00 (weekends noon till 14.00, 17.30 till 22.00). The bar offers a comfortable setting with a full range of drinks including wines, beers, spirits and soft beverages. There is also a bar menu for a range of snacks. WIFI access (BT openzone) is available in the public areas of the hotel and all areas of the hotel have the comfort of air-conditioning. For the business traveller there are 5 meeting rooms with capacity for up to 100. The hotel has a 24 hour concierge service. Do not confuse with the Hilton Hyde Park Hotel on the same road (Bayswater Road). Public parking is available on site and costs £25 per day. Doubletree by Hilton London Kensington: is 1.4 miles (2.2 km) away, has a guest satisfaction score of 75% and rates start from about £116. Doubletree By Hilton Marble Arch: is 1.5 miles (2.4 km) from here, earns a customer rating of 78% and base rates begin at about £152. Doubletree By Hilton Victoria Hotel: 2.3 miles (3.7 km), rated at 80% and with rates from around £161. Doubletree By Hilton Chelsea: 2.5 miles (4.0 km), rated at 87% and with rates from around £93. Compared to other London hotels: This hotel has been rated 81% by past guests. The London average is 80% and the average for 4 star hotels is 83%. Therefore although the hotel is above average for London as a whole this hotel is below average for its sector (star rating) . Doubletree Hotels across the chain average 81% so this hotel is rated as average when compared to other Doubletree hotels. Milesfaster ranking: 389th from 866 London hotels, 7th of 13 Doubletree Hotels, and 175th of 328 four star rated hotels. Another to Consider: Also close by and a similar hotel (0 miles, 0.0 km) would be the 4 star Doubletree By Hilton Tower Of London, whose lowest rates start at about £119 and which has an 89% guest satisfaction rating. The Doubletree By Hilton Tower Of London also offers: free WiFi. Perhaps you would prefer a cheaper option? In that case one to look at is the Chamberlain Hotel. 0.1 miles from here (0.2 km), has scored 91% from former guests where rates start from approximately £87 (theres free WiFi too). Prefer something with a higher guest rating? Then the 5 Star South Place Hotel may be one too look at, it's only 0.7 miles (1.1 km) from here. The South Place Hotel has an extremely high guest rating of 97%, one of the best rated London hotels. 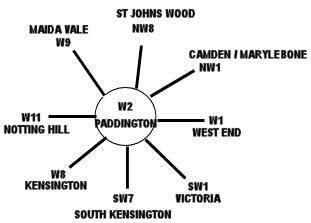 The 50 nearest hotels around this area (150 Bayswater Road, W2 postcode) which we have have on our website extend out to a 0.6 miles (1.0 km) radius. The numbers by star rating are 3 five star hotels (average rating 92%), 22 four star hotels (average rating 80%), 19 three star hotels (average rating 70%) and 6 two star hotels (average rating 68%). Top 4 star hotels are Park Grand Lancaster Gate and the 51 Kensington Court Apartments (both 89%). Coming out as the top rated hotel is Milestone Hotel and Apartments (5 star) at 99%. Base Rates: We compare area starting room rates by using base rates. Bear in mind we use the published base rates which do not reflect short term offers and deals. They do however give a decent relative comparison. Looking at all hotels in the area the average base rate is £108 per night. They range from a low of £11 at Smart Hyde Park View Hostel (2 Star, 71%) up to £720 at Commodore Hotel (4 Star, 60%). Rates break down to the following for each star rating: Five Star average: £231, Four Star average: £141, Three Star average: £72 and Two Star average: £40. Using our in-house algorithm we rank hotels based on guest ratings and weighted for related factors. We have a ranking for Doubletree Hilton London Hyde Park Hotel 16th of 50 and 12th for the 22 four star hotels in the area. Our base rate rank for the hotel is 40th of 50 (15th of 22 four star hotels.). We use the base rate ranking and review ranking for the hotel to get an overall ranking of 30th of 46 for sheer value for money (Smart Hyde Park View Hostel was top). The hotel is above the average 4 star hotel rating for the surrounding area despite being below the average for London. Was called the Ramada Hyde Park until 2013 when it was re-branded into a Doubletree by Hilton hotel under a franchise agreement with Westmont Hospitality.